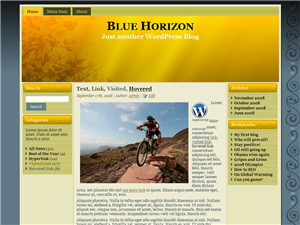 I’m happy to be able to offer the following FREE WordPress themes for anyone to use. If you need a less generic, more customized theme, please use the contact form to send a request and I’ll be happy to create a custom theme just for you. Last modified on 2010-08-06 20:31:23 GMT. 4 comments. Top. 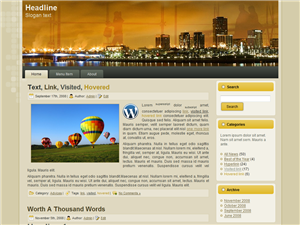 The theme has a fixed-width of 900 pixels, 3 columns and a blue scroll design on the right side of the background. All of my themes use valid XHTML and CSS and are widget-ready. Last modified on 2010-08-06 20:30:35 GMT. 0 comments. Top. 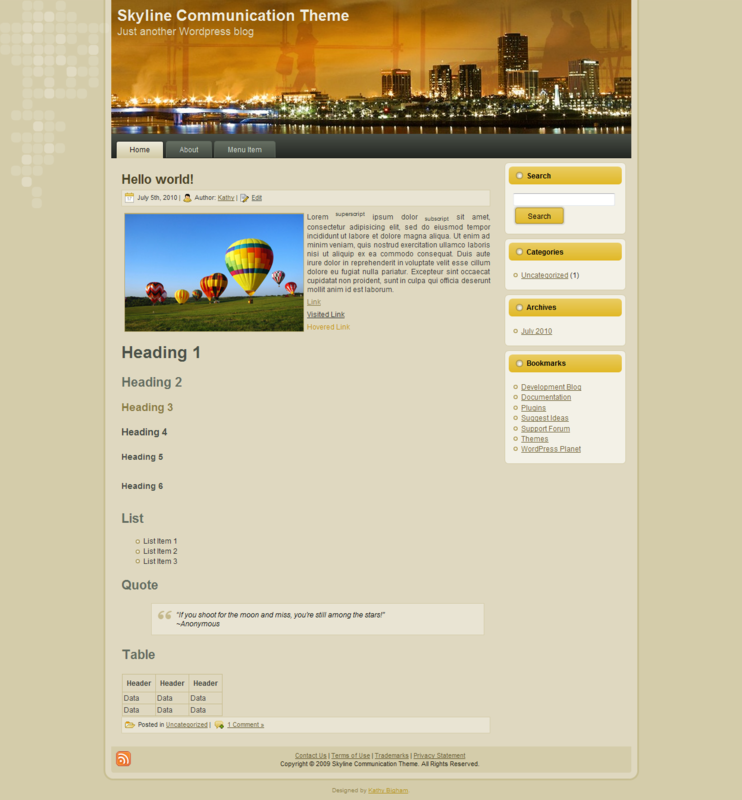 Communication theme in neutral beige with soft orange and gray colors. Great for fast-paced business owners. 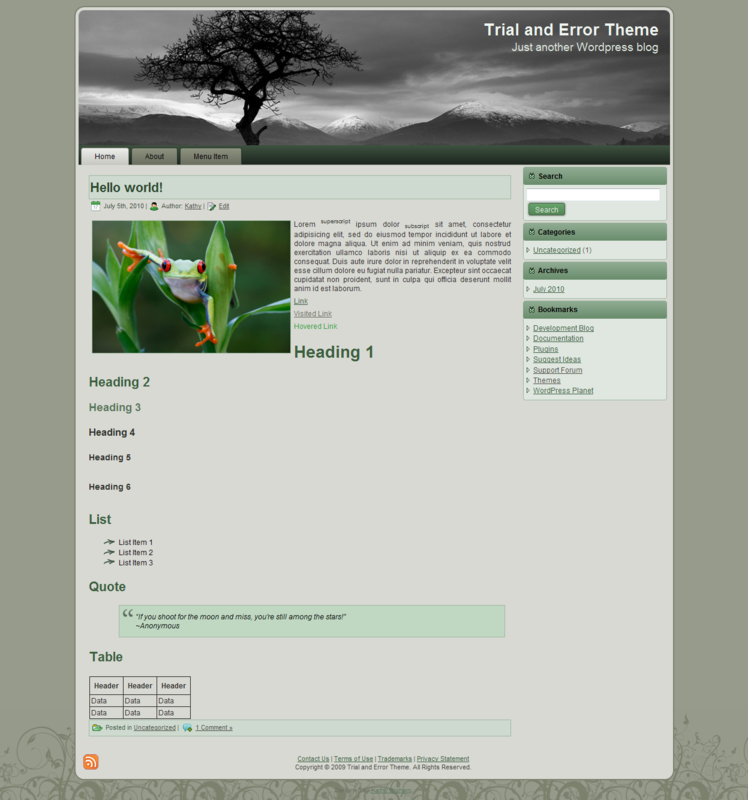 The theme is a fixed width of 900 pixels and has 2 columns, with the navigation on the right. The contrasting skyline with dark and bright colors of a city just waking up has a subtle silhouetted outline of people in the background. All of my themes use valid XHTML and CSS and are widget-ready. Last modified on 2010-08-07 04:17:55 GMT. 0 comments. Top. The name of my new theme is Trial and Error for a good reason. I wanted to try something in shades of green and came up with this beautiful, nature theme. I wanted it to be a little fun and whimsical, so I added a fixed scroll design to the bottom of the background, butterflies as the sidebar header bullets and some fun arrows for bullets in the articles. I believe I’ll be trying different header images to go along with the fun nature design. 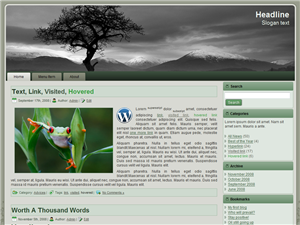 Please tell me what you think about the black and white mountains and tree image in the header? I think the black and white image is a great complement to the monochromatic scheme, but I’d love some feedback if the image works? You can comment here, on my Facebook page, or send me a message through my contact form or on my Facebook profile. Let me know what you think! The monochromatic theme is a fixed width of 1000 pixels, has 2 columns with the navigation on the right side and nicely rounded borders. All of my themes use valid XHTML and CSS and are widget-ready.